Our eyes are the most important of the optical instruments available to us as they not only provide our sense of sight, but also add perspective as well as color to our vision. The eye is incredibly complex, being made up of five different and equally intricate pieces. The iris is one of the most important of these parts. What is the function of the iris? What are the functions of other parts of the eye? The iris is located in the front of our eyes in its anterior compartment where it sits between the crystalline lens and the cornea. To the untrained eye, the iris seems to be a colored disk but in reality it is a thin diaphragm made up of various connective tissues and muscle fibers. The iris is the part of the eye that is colored and it is responsible for controlling the amount of light entering the eye and does so in a way similar to a camera’s aperture. In the center of the iris is a round opening which is known as the pupil. The size of the pupil can fluctuate as the iris has tiny muscles that can either widen (dilate) or narrow (constrict) it. When these small sphincter muscles found in the iris relax, the pupil will dilate and this allows more light to enter the retina. When the muscles contract, however, the pupil will constrict causing a reduction in the amount of light that is able to reach the eye. The contraction and dilation of the pupil is also related to the amount of light in the environment. At night, for example, the muscles will dilate the pupil so there is sufficient light in the eye. When it is too bright outside, the pupil will contract to allow less light into the eyes and prevent damaging the retina. While the tissues are responsible for the amount of light, the pigment within the iris is responsible for a person’s eye color. When there is more pigment within the iris, their eyes will be darker. Each person has a unique iris in terms of pattern and texture and therefore they can be used to identify someone in the same way a fingerprint is used. The iris also serves as a barrier which divides the small posterior chamber from the larger anterior one. The posterior chamber is found between the lens and the iris while the anterior one is found between the cornea and the iris. In some cases, a person may have a congenitally defective or damaged iris and when this happens, the iris won’t function correctly, affecting a person’s vision. If the damage is mild, a person may have tiny holes in their iris. These tiny holes will let extra light into the eye that then reaches the retina, causing shadows known as phantom or double images. In some cases the damage is more severe and too much light will enter the eye. When this happens, it can be very difficult if not impossible for a person to focus on something in front of them. This type of iris defect can be compared to constantly looking into a car’s headlights as the bright light leads to halos as well as glare. Any part of the iris or the components that surround it (including the uvea and retina) may become diseased or infected. One of the most common problems is iritis and this is when the iris is inflamed, leading to blurred vision and light sensitivity. Another common issue is known as iridocyclitis and this affects both the iris and the ciliary body. Although both of these conditions can be successfully treated using antibiotics, you must catch them in the early stages because if they are not treated, they may lead to permanent blindness or reduction in vision. Aniridia is rarer than the previously mentioned problems and it is a congenital eye disease in which the iris is underdeveloped and in some cases only a tiny edge develops. This condition is due to a genetic defect and begins during pregnancy. Iris coloboma can be due to either an accident or a genetic defect and occurs when the iris has a hole, sometimes making the pupil appear to have an unusual shape. 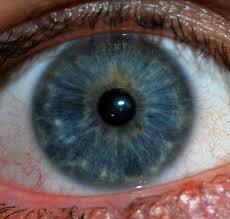 Other possible problems include eye trauma that damages the iris or other forms of accidents. Accidents that can puncture the iris include when the eye is pierced with a sharp object and a hard blow or jab to the eye (such as a fireworks). The cornea is the outer covering of the eye and is dome shaped. It protects us but we are still able to see around it. It is here that the majority of the light is focused and it includes multiple layers such as the epithelium (the tough outer part which quickly regenerates). This is the part of the eye that is visible and white. It protects and provides structure for the eye’s inner parts. Lacrimal glands are located on the outer area of the eye and responsible for producing tears. Conjunctiva is a layer of mucus which keeps the eyes moist and problems with it can lead to pink eye. The Vitreous Humor is located near the back of the eyeball and is the gel-like substance that is responsible for giving the eyeball shape. The Aqueous Humor is a water region and has two parts: the posterior chamber behind the iris and the anterior chamber in front of it. As explained earlier, the pupil is the colored part of the eye and contracts and expands depending on the amount of light available. The lens is clear and located behind the pupil. It changes its shape to focus light by using the ciliary body, which are muscles. The retina is found on the inner part of the eye and is where images get transmitted to our brains. It is made up of multiple layers including rods and cones. It also contains the macula (responsible for detailed vision) and fovea (responsible for detailed perception). Why Do You Have Watery Eyes in the Morning?